And it could have actually been live if they'd just had an understudy! This Sunday, FOX had the first "live" TV musical of 2019: "RENT." And I put the word "live" in quotes because... because 99 percent of what aired was actually pre-recorded from Saturday's dress rehearsal. Unfortunately, Brennin Hunt, the actor playing Roger, broke his ankle during Saturday's final rehearsal. FOX announced that since Hunt certainly couldn't move around the stage, portions of the show would be from the Saturday recording. But apparently, FOX interprets "portions" as "all but the very last scene." And unfortunately, the fact that this wasn't the real live performance showed. Let's break it down. Insert the heart eye emoji here because the RENT ensemble was so amazing. This ensemble was filled with talented individuals pouring their hearts into every word. The harmonies were always beautiful and powerful, nearly making you cry during numbers like "Will I" and "Seasons Of Love." Brandon Victor Dixon (BVD) was a shining light in this show. Having just done "Jesus Christ Superstar: Live in Concert" last spring, we all knew he can act and sing like no one's business. Plus he was in "Hamilton" as Aaron Burr. He was very underappreciated in "Rent," however. "I'll Cover You" saw his mic being dropped, leaving one of the typically wonderful harmonies between Collins and Angel to TOTALLY DISAPPEAR because Valentina was struggling to have air to maintain the note. One of the only actors with actual Broadway cred, the man can belt and nearly made me cry during "I'll Cover You (Reprise)." While Valentina didn't have the strongest vocals for the role, that girl acted her heart out. It was clear this role was important to Valentina, and she nailed the sassiness and boldness we all love in Angel. Valentina was hilarious to watch and perfectly on beat during "Today 4 U." Her and BVD were a great Collins and Angel: sweet and heart-warming, breaking your heart when you remember what happens later on...and again near Angel's end. Watching BVD carry her around during "Without You" tugged on my heartstrings. The set was insanely cool. I love that they kept the scaffolding-style set, with parts all around to fully immerse you n the show. This kept some of the show's heart and roughness in there. Kudos to the set designer(s) for creating an amazing set/jungle gym for the cast to move around on. 5. Vanessa Hudgens as Maureen + Kiersey Clemons as Joanne = DAMN. Vanessa Hudgens BROUGHT IT as Maureen. I wasn't 100 percent sure if she would be a good fit, but she nailed the character and made it her own. "Over the Moon" was perfectly overdramatic and absolutely hilarious. (Also, Jordan Fisher's face as he's holding the curtain while Hudgens is hooked into her harness was HILARIOUS.) Hudgens really got to show off her singing and acting chops in this show, reminding everyone that she's no longer Gabriella from "High School Musical." Kiersey Clemons was the perfect Joanne to Hudgens' Maureen. Their vocals blended so well together, and I loved their rendition of "Take Me Or Leave Me." She brought out more of a 'tude in Joanne, which I liked. And oh my lord, the "Tango: Maureen" was FIRE. Clemons and Fisher were hilarious and their vocals worked so well together. Clemons showed that she knows how to move with flair. 6. Keala Settle had an actual role, not just the high notes! I love how they had Keala Settle come in to sing the high notes of "Seasons Of Love," but didn't just have her do that. They gave her a real part in the ensemble, which I liked. Having her as the person running the AIDs group meetings added some sentimentality to her appearances throughout the show, especially at Angel's funeral. I didn't 100% love either of their performances, but they acted their respective characters well and had some pretty good chemistry. Tinashe really nailed the character's heart and roughness. I almost cried when the cameras turned and the curtain went up to reveal THE ORIGINAL RENT CAST. My heart felt so full to see them, and in the iconic line too. This was a beautiful end to a show that was definitely frustrating and heart-hurting to many. 9. WHY WERE THERE NO UNDERSTUDIES? Every single theater person knows you ALWAYS cast understudies. ESPECIALLY for shows as intensive and as popular as "Rent." Welcome to the theater, Fox: you have to be prepared for anything, and there's absolutely no reason you shouldn't have understudies. It was so frustrating to be promised a live production, only to receive a pre-recorded show that honestly could have just been uploaded to Netflix at that rate. I would have preferred to see the concert version the cast gave for their studio audience while the recording aired. From the footage I've seen, it looks so much better than what we got! Ever heard of "the show must go on?" Clearly not, if your idea of that is "let's air a pre-recorded version for a 'live' musical." Valentina, poor baby, was struggling to sing her notes. I will credit the fact that it was a dress rehearsal and she probably would've been a bit more prepared if they were doing the actual live show. Fisher has a great voice, but he has a softer tenor voice with none of the edge you typically hear (think Anthony Rapp's vocals). Hunt, too, sounded like he was forcing the edge in his voice. Also, he fell flat in "One Song Glory" - so many lines could have been more rounded out, but they were just...meh. I'm not even going to start on the changed lyrics. You could have started a drinking game on that alone, so let's move on from that. "Seasons Of Love" and "La Vie Boheme (Reprise)" both had the wrong people singing certain parts, which took away from the intentions of having the original roles sing those lines. Like taking Collins' line of "In bridges he burned/Or the way that she died" and giving it to an ensemble member took all the heartbreak out of the line because we know what happens to the person he loves. What on earth was up with those expository monologues? They were entirely unnecessary and frankly, awkward. 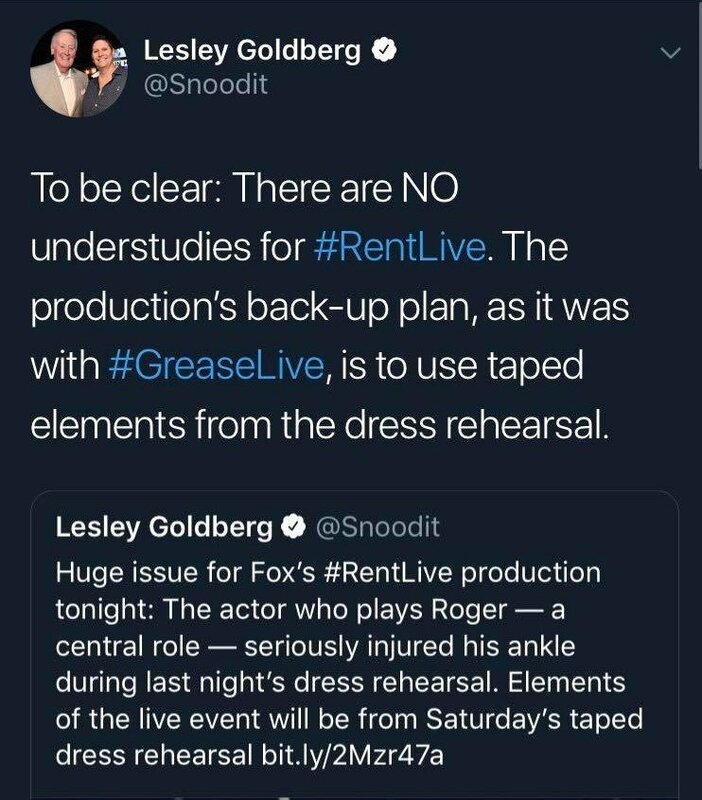 At this point, we all know at least the basics of what "Rent" is about - and anyone who wasn't familiar with the show and tuned in for the names definitely would have Google'd that. In particular, the monologue before the first life support meeting was clearly meant to be impactful and show just how prevalent AIDs still is, but it took one out of the show and back to modern day - during a show taking place in 1991. 13. "I'll Cover You" was a disappointment, not the romantic duet it should be. Don't get me wrong - acting-wise, the chemistry between Collins and Angel was so there. But everything else was disappointing. Brandon Victor Dixon was clearly singing but for some reason, his mic was waaay low. And Valentina, poor dear, was struggling to maintain breathing and hit her high notes. For a duet as beautiful and sweet as "I'll Cover You," this was not my favorite performance. I will say that the staging was cool, and I loved the playground elements. 14. NO ICONIC LINE STAGING FOR "SEASONS OF LOVE." They didn't do the iconic line staging for "Seasons Of Love" and that really took away from the number, sentimentality-speaking. 15. Confusing standards of what was/wasn't censored. 16. "La Vie Boheme," the least boring song, was boring. "La Vie Boheme" is supposed to feel like a party, make you want to get up and dance. This...did not. The music was bare and understated, mostly piano - where was the guitar? The bass? The intensity of the instruments that normally make this song pack a punch? They also cut the waiter's bit in the middle, for what seems like absolutely no reason - certainly not censorship. I will give Fisher this, he was perfectly overdramatic as Mark in the song's beginning. There were so many times the cameraman was SHAKY. It was honestly frustrating and took you out of the moment. Also, there were Too. Many. 360. Pan. Shots. It was dizzying and honestly, just took away from the scenes rather than adding whatever effects the director or whoever thought it would add. 18. Jordan Fisher was a decent, but not super amazing, Mark. Jordan Fisher as Mark was not my favorite casting choice. Fisher has a beautiful voice and yes, he does have performance cred ("Hamilton," "Grease Live," Disney Channel's "Teen Beach Movie"). But I just didn't feel like he was a great casting call for this role. His Mark had none of the grit and roughness the character is supposed to have. It's one thing to bring something new to each rendition of a show, but it's another to cast aside a character trait entirely. However, he did add some sass to the character and meshed well with his fellow characters. As I said before, he was amazing and hilarious in "Tango: Maureen." His character's good, long-standing friendships with Roger and Collins were prevalent in how comfortable the three always acted together - clearly the result of true friendships that formed during rehearsals. Considering Fox had the benefits of using post-production tools since majority of what aired was pre-recorded, it's really, really ridiculous that they didn't clean up the sound and re-record any vocals that fell short in the original recording. That could have helped the show's quality. 20. YOU DON'T STAGE DIVE IN THEATER. Having Roger and Mark STAGE DIVE and heavily interact with the audience during "What You Own" not only ruined a scene that's supposed to be a moment of realization for the two characters, but destroyed any concept of "fourth wall." It immediately took you out of the show. This is theater, not a concert. "Rent Live" wasn't horrible. It definitely could have been better, but it wasn't the worst thing ever. Frankly, I would have loved to watch what was actually happening on the stage: the concert-style version of "Rent" the cast was giving for the audience. But hey, that's what YouTube is for!